William Fleming Cormack (Bill) the second son of Mr and Mrs David Cormack was born at Royal Bank house in Lockerbie in 1920. He received his early education at Lockerbie, Moffat and Merchiston Castle School, Edinburgh. His university studies were interrupted when, in 1940, he enlisted in the Argyll and Sutherland Highlanders. Following a spell with the 15th Battalion in the Orkneys, he joined the 7th Battalion and was transfered to Egypt in 1942 as part of the 51st Highland Division of the Eighth Army and there took part in the Battle of Alamein in October of the same year. Taken prisoner at Gerbini in Sicily he was in several POW camps in Italy and then Germany, notably OFLAG VA at Weinsberg. Promoted Captain on his return to Britain, he was able to resume his law studies in 1946, graduated MA, LLB and obtained his WS qualification during 1949 — and later that same year joined his father in the family business 'Cormack and Byers, WS' in Lockerbie, where he worked until his retirement in 1981. He died on 1st August 2002. For over 50 years Bill was associated with local and national archaeological and antiquarian societies. His association with this society commenced with his election in 1951 — following in the footsteps of his father David and grandfather John who had been elected, respectively, in February 1913 and June 1893. He was appointed a member of Council in 1961; a Vice-President for the period 1964–67; and in 1979 appointed, under Rule 10, a Fellow of the Society in recognition of his having 'done outstanding scientific work'. In 1964 he was appointed Business Editor of the Transactions — and thus continued until the time of his death. Very early in his editorship, 1965, he was principally responsible for the introduction of the present green-covered crown quarto format of the volumes. Under his detailed and diligent editorship he produced some 35 annual volumes — and, additionally, the Cruggleton Castle monograph and the Index to the First and Second Series of the Transactions. To this workload was added the editorial work associated with the work of the Ann Hill Committee — of which he was a founder member. As well as his meticulous editorial skills, he brought to the Ann Hill Committee an enormous wealth of advice and information. In particular he advised the engagement of Roger Mercer to take charge of the archaeological and buildings survey of Kirkpatrick Fleming, and this in turn gave access to the skills of a variety of experts in their respective fields. A particularly enjoyable aspect of many Ann Hill Committee meetings was the period after the formal business when he would lead the conversation through a multitude of byways of archaeology, history and indeed many other subjects. All these various volumes of publication will stand for years to come as a fitting monument to his memory. His own publications and scholarship were of the highest standard; he published widely on topics ranging from the Mesolithic to 19th century traditions. He was an excellent field-walker with a 'nose' for a significant find - no matter how unpromising the locality. These finds generally saw an early appearance in Discovery and Excavation in Scotland and the presentation of the artifacts to the appropriate local museum — his work as an excavator was also renowned. He had a particular interest in the Mesolithic and was involved in much of the early identification of coastal sites. He excavated, among others, the Mesolithic sites of Low Clone and Barsalloch; a Bronze Age cairn site in Luce Sands; prehistoric sites at Kirkburn, Beckton and Harthill, all near Lockerbie; Dinwoodiegreen, Annandale and a corn-drying kiln at Airylick, Port William. Rising to the challenge made by the late Ralegh Radford at the Society's Centenary Meeting in 1962, over the location of early church sites, he turned his attention to local parish churches. There his local knowledge and research on landscape, artefacts and oral traditions lead to the discovery and subsequent excavation of the important early church site of Barhobble. The results of these excavations, carried out with the help of his wife and other dedicated members from 1984–94 were published in an exemplary fashion in the dedicated Volume 70 of the Transactions. Visitors to the excavations were always highly impressed with the immaculate presentation of the site and the information and welcome given to them. He was also an active member of the Society of Antiquaries of Scotland, to which he was elected a fellow in 1961, serving as a council member from 1967–70 and vice president from 1970–73. Bill was on the Board of Trustees of the National Museum of Antiquities of Scotland from 1972 until the establishment of the National Museums of Scotland in 1985. In 1995 he was awarded an MBE for services to archaeology in SW Scotland and in 1998 the Society of Antiquaries of Scotland presented their 'Dorothy Marshall Medal' for his outstanding service to archaeology for nearly half a century. Besides archaeology, Bill had many wide-ranging interests. He is survived by his wife Sheila, two children, two grandchildren and two great-grandchildren. 'Further Surface Finds on Burnswark'. Ibid, p.189. 1963 'A Prehistoric Site at Kirkburn, Lockerbie'. TDGNHAS, Vol. 40, p.53. 1986 Barhobble — Interim Report, No. 1 1984–5. 1987 Barhobble — Interim Report, No. 2 1986. 1988 Barhobble — Interim Report, No. 3 1987. The Iron Mail from Wyre, Orkney. MS Notes for private circulation. Copies in NMRS and Tankerness House Museum, Kirkwall. 1990 Barhobble — Interim Report, No. 5 1989. 1991 Barhobble — Interim Report, No. 6 1990. 1992 Guide to Barhobble, Mochrum, Galloway — An Early Church Site Rediscovered. (2 × A4 leaflet). 1994 'Mochrum Parish to 1560'. In J. Hunter et al (eds) Mochrum — A Parish History. Wigtown. 1995 Guide to Barhobble. (Revised leaflet). George Petrie (Orkney Antiquary), MS Notes (with Margt. Watters and Sheila Cormack). Copy with Orkney Archivist. 1999 Guide to Barhobble — (revised leaflet). Obituary - Jack Gillespie Scott Scottish Archaeological News. 'Porfido Verde Antico' in Newsletter of Soc. Ant. Scot., No. 11.1. 1955 Pottery find at Crawthat Cottage, Middlebie Parish. 1962 Flint scraper found at Shuttlefield, Lockerbie. Bronze buckle find from Luce Sands, Old Luce Parish. Flint slug knife from Kilfinnan, Old Luce Parish. Flint knife from Redkirk Point, Gretna Parish. 1964 Mesolithic sites at Mull Glen and Drummore, Kirkmaiden Parish and Innerwell, Kirkinner Parish. Bronze penannular brooch, 2 black farthings of James III from Luce Sands, Old Luce Parish. Mesolithic site at Dalton Hook, Dryfesdale Parish. 1965 Mesolithic site reported at Gillespie, Old Luce Parish. Mesolithic sites at Gillfoot, Maxwellfield and Tallowqhairn, Kirkbean Parish. Petit-tranchet arrowhead found on Kirkburn, Dryfesdale Parish. 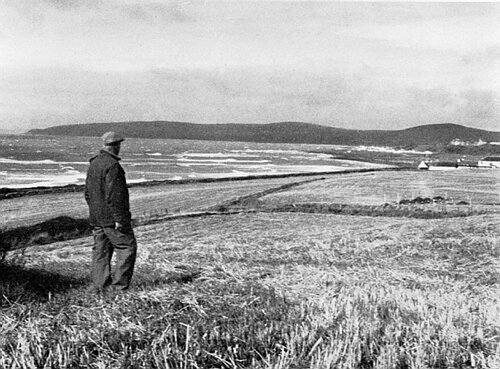 1966 Mesolithic site at Brocklerigg, St Mungo Parish. 1967 Bronze penannular brooch and Anglian coin from Luce Sands. Roman coin reported found at Wigtown. Romano-British glass bangle find at Kirkhill, St Abbs. 1968 Mesolithic site reported at Monreith, Glasserton Parish. 1969 Mesolithic site at Grennan, Stoneykirk Parish. 1973 Kerb grave at Valtos, Lewis. Flints and pottery at Ard Nisabost, Borve and Hushinish, Harris. Flint scraper found at Newbie, Annan Parish. 1976 Bronze pin, spindle whorl etc, Torrs Warren, Old Luce Parish. 1982 Mesolithic site, glass bangle frag. etc, at Portankill, Kirkmaiden Parish. Whorl, shell midden and mesolithic site at Sheddock, Whithorn Parish. 1983 Inscribed stones in wall of 10 N. Bank Street, Wigtown. Stone jetty in Auchenmalg Bay, Old Luce Parish. Shell midden at Sheddock, Whithorn Parish, C-14 dated. Causeway etc at Rough Loch, Mochrum Parish. Pottery and flints at Cruggleton Castle, Sorbie Parish. Mesolithic site at Kilfillan, Sorbie Parish. Scratch sun-dial at Kirkmadrine, Sorbie Parish. 1985 Flint scatter etc at Carlin Stone, Derrie, Mochrum Parish. Mesolithic site at Bladnoch, Kirkinner Parish. Mesolithic site at Portyerrock, Whithorn Parish. 1986 Flint knife from Falhaar, Whithorn Parish. 1988 Burnt mounds at Falhaar, Whithorn Parish and Eggerness, Sorbie Parish. 1993 Compass-inscribed circles on wall of Kirkmadrine, Sorbie Parish. 1995 Polished stone axe find reported from Dixons, Tundergarth Parish. 1996 ?Chapel, occupation material, Cill Choinnich, Colonsay & Oronsay Parish. 1998 Medieval pottery, Whitekirk Mains, Whitekirk & Tyninghame Parish. 2000 Medieval pottery and glass fragment, Whitekirk Mains, Whitekirk & Tyninghame Parish.